The average American eats 30 pounds of french fries a year. I found this statistic on a website devoted to the history of french fries. French fries are a much loved staple for us Americans. We probably out do the Belgians who consider them a national treasure. I really love french fries. When they are fresh, they have a great taste. 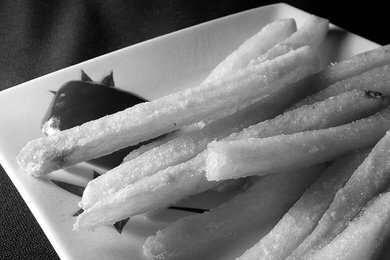 They are made by slicing and deep frying potatoes and then adding salt. The bummer is the deep frying part, because the calories in these little buggers is through the roof. Compare them to eating a plain potato. A 5 ounce potato will put you back 110 calories. And the great thing about potatoes is that they are nutritious, with more potassium than a banana, vitamin C, and no fat. BUT, we don't eat them plain, do we? For those of you with the self control to order a small fries, you are looking at 245 calories, while a medium sets you back about 400 calories. what about homemade fries? where you slice up potatoes and fry in a healthier oil such as peanut canola or sunflower? TK - great question. I don't know how many calories are in homemade fries - but I do know that fast food companies fry their potatoes twice - once at the factory and again at the restaurant. My guess is that yours would be alot better for you. Also, if you roast potatoes in the oven (sliced) - you can still get that crunch without deep frying. You know what? I watched a programme where a person was told to eat everything with his eyes closed and chew slowly to taste. I tried this with french fries at a few fast food chains and now I can't stand them - same with processed cheese. They taste is disgusting - and now it's one thing I don't have to worry about when I'm craving something - try it!